Recently, we launched a vision that has haunted me for over 7 years. It is an embarrassingly large preposterous vision. Only someone stupid or possessed by God would dare to dream of what we are about to do. I know you are good and curious right now... and we will fill you in soon. In the meantime- I am afraid and that must be common to other humans so let's talk about it. The day I was about to finally jump, I was sitting on an old red couch decorated with little brown horses, at my sister's ranch. It was time to see if anyone else would be insane with me. I had procrastinated and we couldn't wait any longer (My teammate and dear friend in this Lindsey Nobles was about to beat me up if I kept waiting), so I sent the texts and emails and waited. God, is humiliation part of your will for me? Did I make this vision up in my head or was this really you? I was launching something into motion out of sheer faith, an assurance that my God was real and in this. I was convicted that this vision was not tainted with self-confidence or established as a rationale solution to a problem. It was a result of foolishness or faith. And I knew which one it was. My unseen God had given us more than enough evidence to trust this was from Him and for Him. that I'm living stupid for things unseen. that I risk my reputation for His. that others' needs matters more than my comfort. that I feel inadequate because the dream is too big to accomplish alone. that I am so terrified that I actually pray without ceasing. And for just that brief moment I didn't care if He let me hit the ground. I was in. The risk felt worth it. Surrender. "This is crazy. I am in and I think God is all over it." Not 1, not 3 but so far every response has read... YES. I wasn't alone. I wasn't the only stupid one who was hungry to see God move and it looked like with all of us united- we may just get to watch him show off. 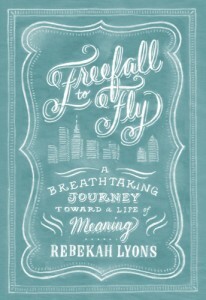 One of the crazies I texted that day was Rebekah Lyons who wrote about her freefall in the most beautiful book and it comes out this week. I am giving away two copies of Freefall to Fly today. Go order it now. It will move you and you will want to live stupid with us. Soon we will tell you more about our crazy dream and we will ask you to join the whole lot of us- because it is no small thing. We live once and then we meet God. I think we should live it banded together and running brave for things that last. I think it actually could turn out to be crazy fun too. Soon. Tell me about a time you have felt a freefall in your life or with one word describe a place you feel afraid right now. We can all pray for each other as we jump scared. We will choose two of you to get Rebekah's book. Thankful for kindred friends- that make us more brave. You all are in this category for me. Thank you.